Gaithersburg HELP agrees with the City of Gaithersburg – character DOES count! Recipients live or work within Gaithersburg and their actions benefit the community. 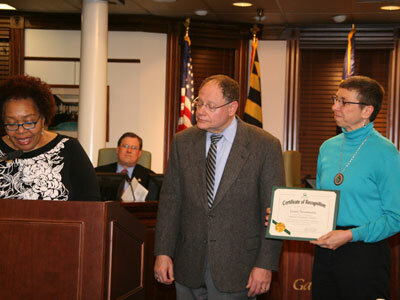 On February 3, 2014, the Gaithersburg Mayor and City Council presented this award to our very own Janet Neumann. Janet is a senior member of the Executive Committee at Gaithersburg HELP and is the Assistant Director of Financial & RX funding; she is also the UMAN Representative for the organization. Janet Neumann is a dedicated volunteer who exemplifies the Six Pillars of Character. She has been involved with Gaithersburg HELP for more than 10 years and is a member of the Board of the Upper Montgomery Assistance Network, taking on multiple leadership, training and fundraising roles. Ms. Neumann’s unselfish giving has impacted many City residents and her dedication to collaboration and working with City government and nonprofits is unwavering. She is a volunteer who truly “goes beyond the call of duty” and is an integral part of the Gaithersburg giving community.